The METACONCEPT Group’s silver brazing creams are comprised of a homogeneous blend of metal powder, flux and binding agent. They are generally packaged in a syringe and can be applied manually or mechanically. Solder cream is a paste designed for the more accurate assembly of parts that do not require active fluxing. Indeed, the choice of powder, its granulometry and the quality of the stripper means that the cream has a very precise action. The product’s packaging enables precise application and optimised joint quality. Waste originating from the use of these products can be recycled.Contact our recycling department to find out the terms and conditions. The METACONCEPT Group can also offer palladium-, copper-, nickel- and aluminium-based brazing creams. Please do not hesitate to contact us. Storage of creams: 18 months in a refrigerator at 10°C +/- 5°C. Normal temperature of use: 20 to 25°C. 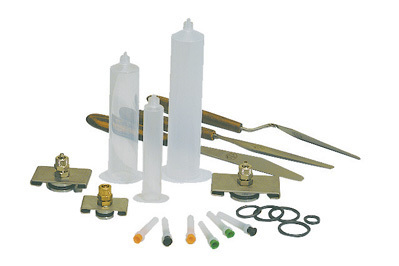 The creams above are supplied in 3, 5, 10 and 30 cc standard plastic syringes (10 to 100 g depending on the alloys). Other packaging options are also available upon request. The syringes are equipped with needles which are perfectly suited to the application system. The needles range from 0.15 to 1.60 mm in diameter; they are plastic or metal, straight or curved, long or short to take advantage of technology across all processes. The creams are used in all industrial sectors requiring the use of automated or manual brazing operations. The parts to assemble must be totally clean and degreased. The “refusion” is achieved using a flame, furnace, via induction or electrical resistance. For dosing operations that require optimal application control, use a dosing applicator for the creation of uniform points and regular filling. Always use a flux suited to the intended use. Contact our technical department o ascertain which product is most suited to your application.